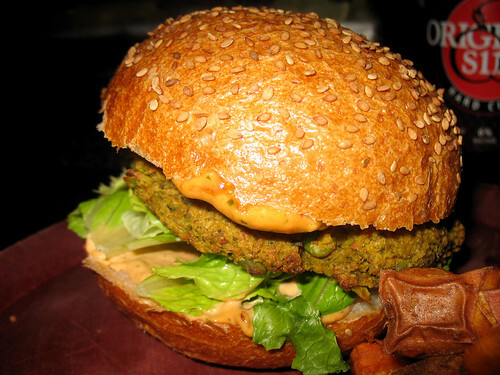 I love it when the opportunity to try a new veggie burger coincides with a night out. Even if it means that I get some odd looks when I’m sitting at a bar taking photographs of my burger, with my camera’s flash on because the lighting is too dim, and some guy standing next to my friend and I seems to think this is his opportunity to be awkward and annoying… by which I mean he probably thought he was hitting on us, but “I’ve never seen anyone take that many photos of a burger before” isn’t really a successful pickup line that works on me (well, let's be honest... it actually would have worked if he was cute and followed it up with any discourse of intelligence and substance, but he wasn't, and didn't). 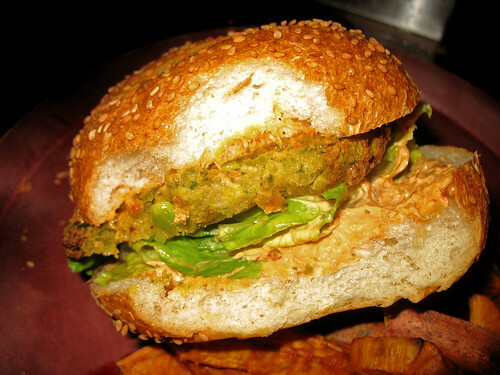 Described as “Veggie patty made of fresh roasted vegetables topped with lettuce, pickles, and chipotle aioli on a sesame roll. Served with sweet potato fries.” I asked our bartender if it was vegan, and she must have gotten that question a few times before because she answered promptly, “no, there are eggs inside it”. Definitely a house-made patty, which I appreciated, but it was pretty mashed together and no vegetables or individual flavors really stood out. I could see carrots and bits of what I presume were soy beans, and probably spinach, but overall the taste was rather bland and mushy. It was missing that lovely crispy outside that properly grilled or fried burgers usually have. The blandness was almost compensated for by the delicious chipotle aioli sauce though. Rich, spicy, and smokey – that stuff was delightful! It just could have used an onion or something else in addition to the lettuce to balance the flavors a bit. Lettuce and pickles alone are a pretty poor spread of toppings, even with a sauce as good as this one. But my main complaint was the bun – it was MASSIVE in comparison to the patty and toppings contained between the two sesame-seeded slices! The whole thing was was about 80% bun and 20% burger patty. I ended up tearing bits of the bun off just so I could actually enjoy the burger’s flavor instead of just choking on a mouthful of slightly-stale bread with each bite. If it had been a bit fresher, the actual flavor of the bread would have been fine. But I couldn’t get over how oversized it was, and how annoying that made the act of eating it. I enjoy Union Hall, so I’ll definitely return – but I’ll try a veggie burger from some other place nearby (I have a long list of other places to try in Park Slope) before going to the bar, next time. I forgot to snap a quick shot or two of the bar itself, because I was busy playing wingman to my friend… so you’ll just have to trust me when I say that it’s a beautiful place with tall bookshelves and cozy seats by a fireplace, but large and filled with tons of people and a bocce ball court. 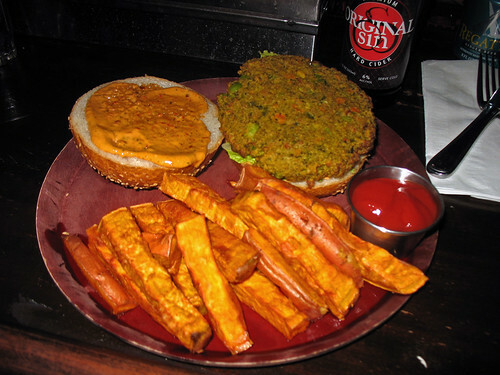 Plus, they have $4 bottles of Original Sin, and the sweet potato fries were good even if the burger was not!